I envisioned heading out to the chicken yard in a pretty apron, grabbing a good-sized chicken, swiftly processing it on a chopping block, and bringing it into the kitchen. I envisioned just a few short hours between barnyard and table, proudly serving a beautiful roast chicken that would taste awfully similar — if not superior — to a grocery-store roaster. Then I did some deeper research and gained some experience raising dual purpose chickens — and expectation met reality. 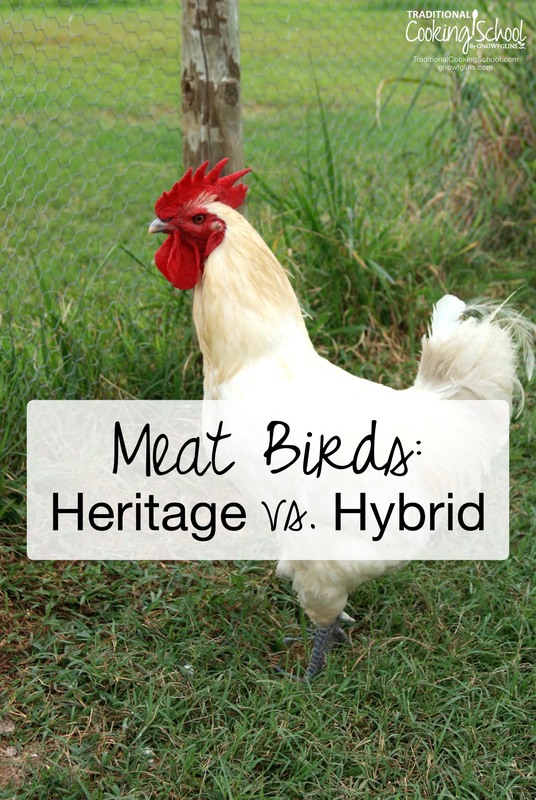 …just like there are heirloom and hybrid vegetable seeds, there are heritage and hybrid breed birds, and both categories have their advantages and disadvantages. Heritage birds are to poultry what heirloom seeds are to gardening. Breeds include Orpington, Delaware, Rhode Island Red, Sussex, etc. It's the most sustainable option. If you have a rooster, you can allow birds to hatch naturally or hatch your own. Separate the roosters from the growing flock, and when they get to be of a desirable size, process them for meat. Keep the female birds for egg laying. Most are dual purpose. Two for the price of one! Sort of. With little effort beyond maintaining your flock, you will be rewarded with meat as well as eggs. You can help preserve some endangered breeds. Many of these breeds have been cast aside in favor of the faster growing hybrid birds. By breeding and raising a flock of your own, you are helping to preserve and build the ranks of lesser known breeds, some of which are endangered. By selling eggs, and perhaps hatchlings you can help promote local interest in the breed as well. Not as much meat on the bone. This is the main reason why some heritage breeds are not as popular as the hybrids. Their carcass is smaller than what we're used to seeing in the store. If you raise these, you may need to grow more birds to satisfy your family, or get used to eating less meat when you serve a chicken. Also, the meat tastes a little different depending on the breed. It's also a bit chewier, although not necessarily dry. This is an acquired taste for many. They can be more expensive to raise when you figure in cost of feed per pound of meat. You'll be feeding these birds longer than hybrids, which increases the cost of keeping them around. Since they tend to produce a smaller carcass, this is something to consider. They can take a long time to grow, making for tougher meat. Hybrids can be processed as soon as eight weeks. Heritage birds will be ready in twelve weeks, or even longer. Think hybrid seeds! These are produced with specific beneficial characteristics in mind. They include Cornish cross, Cornish rocks, etc. They grow fast and are ready for butchering within eight weeks. As mentioned above, they grow very fast and will be ready to process as soon as eight weeks, or they can continue to grow to about twelve weeks. They are tasty and similar to what you will get in the grocery store. The flock of Cornish rock birds that we raised were some of the juiciest and tastiest that we had ever had. The carcass was not unlike what you would purchase in a store, but with the added benefit that you raised it yourself, having complete control over the environment, feed, and quality of life. They are economical when you figure in the cost of feed per pound of meat. Because they grow so quickly you won’t be keeping them around long. They also fill out nicely. A bird processed at twelve weeks produces a nice sized carcass, enough for leftovers. Many cannot reproduce on their own which means you will need to start with chicks each time you want to raise them. If this is the route you want to go, you need to locate a hatchery to provide chicks. There are several available online that will ship through the mail if you can't find a local source. They need to be carefully monitored. Overfeeding can harm the birds. Because of rapid growth, they can develop heart problems or become too heavy for their frame, resulting in broken legs. To alleviate this problem, we fed ours on this schedule: three times a day, all they could eat for fifteen minutes. This worked perfectly, but it also added to our already full chore schedule. They don’t typically lay eggs. I've had friends who have kept some of their Cornish birds around. While a few might lay an egg here and there, they not only have a very short life span, they aren't reliable egg layers. We absolutely love the dual purpose heritage breed we're now raising — the American La Bresse. They taste great and can be processed at twelve weeks. They're also wonderful layers and have yet to go broody. Yet, while the La Bresse does have great flavor, similar to the dark meat of a turkey, there are times when we miss a good ‘ole roaster just like the rotisserie chickens one gets at the deli. Our decision: we'll raise both heritage and hybrid. Do you raise meat birds? What are some of your favorite breeds? We are now raising Freedom Rangers. We’ve done both dual-purpose and Cornish Cross, but it was a huge disappointment to use the heritage ones for meat. We have a large family, so it is just not at all economical or practical to raise heritage, with scrawny little carcasses that usually only taste good when cooked a certain way. We like the crosses for more versatility. That being said, we hated how the typical Cornish are big ugly birds that do tend to have health issues because of their growth pattern. But they are economical; they’re feed/meat ratio is much better than a typical Dual-purpose breed. However, we have discovered that the Freedom Rangers are almost the best of both worlds! They aren’t good egg layers, but the breed are pretty birds that are shades of brown, and as their name implies, they are good foragers, unlike the Cornish cross that just sit in front of their feeders all day in their own poop. We’ve had no heart or leg problems with these birds; they are vigorous and healthy and much nicer to look at, producing cleaner carcass on butchering day. But more importantly, they grow almost as fast as the traditional meat breed, ready to be butchered at 11-12 weeks in our experience. The carcass is plump like a hybrid, too. The chicks cost a bit more at the outset, but I believe this is made up for when you factor in the fact that we did not lose any out of the 100 ordered, whereas usually we can expect to lose several of the others due to one problem or another. For the best value, I recommend ordering direct from Freedom Ranger Hatchery in Lancaster, PA. I believe this is an Amish-run business. If you order 100+ (find a friend to split if you don’t need that many!) you can get the best value, as you won’t pay shipping. Thanks so much for the info Tricia! I have heard about Freedom Rangers but never tried them. We may have to look into those someday. Also, your chickens get all the good natural sun light and you have provided them with all the bugs, etc that they need. Commercial raised “vegetarian” fed poultry are for the birds…no pun intended. Keep up the good poultry husbandry. I don’t know anybody with common sense that would want to raise and/or eat like the poultry that you buy at the store! If you take the same the same nutritional value that is fed to those store bought chickens up to a 6 month old human child, that human baby would be statisticallying 600 pounds. That is scientific fact. Dr. Oz had a great 15 minute segment on his show last week and also on his web sight called “Why doesn’t your chicken taste like your grandmothers?” Commercial raised poultry rarely, if even ever, get natural sunlight and are raised on vegetarian feed. Chickens are NOT vegetarians. God did not program that way. I raise 50 chickens and ducks for eggs. Yes, I have bought commercial poultry meat before I really started studying what we put into our bodies. Americans, as a society, eat too much meat anyway. Save your $$ for a good poultry dinner. Once you’ve tasted it, you never want to go commercial again. I’m very surprised that this is even an issue of pro and con’s here. The heritage breed definitely taste better, my grandparents live on a farm and have always bread these types of chicken. We have had great luck with Freedom Rangers too! When they are big enough, they are very hardy and we allow them to free range with the rest of our chickens and at 90 days, we get some tasty meat! We opted not to get Cornish after talking to some friends who are very experienced homesteaders…they actually helped us process ours and were so impressed with the proportion that they are considering them for their next round of meat chickens.